One of Hiroshige’s most beautiful triptychs: Sumidagawa setchu no zu,“The Sumida River in Snow” from a series Edo meisho shiki no nagame, “Views of the Famous Places of Edo in the Four Seasons.” Shows a ferry landing on the Sumida with a beauty disembarking from a boat and another pair ready to board. Published by Maruya Jinpachi, c 1847-8. Rare. Very good impression and colour. Horizontal centre fold, otherwise good condition. 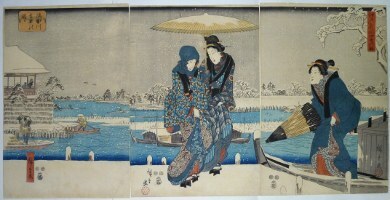 Signed Hiroshige ga.